Competition time! We’re at it again, giving you the chance to win paintballing tickets for you and nine of your friends. 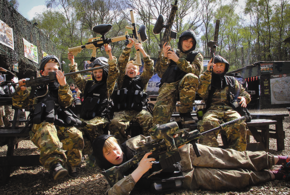 This month we’ve teamed up with the fantastic Bedlam Paintballing to offer you a great bundle of a paintball prizes, plus one of our beechwood smoked frankfurters to keep you fuelled throughout your fun-filled day. Entrants will have the chance to choose from four locations, including Aberdeen, Dundee, Edinburgh and Glasgow. CAUTION: MAKE SURE YOU CHOOSE THE CORRECT LOCATION. Beechwood smoked frankfurter for lunch! To be in with chance of winning, simply click on the location below you want to win tickets to and follow the instructions. Good luck! Tickets expire 8 weeks from winning Date issue. Group for up to 10 Players. Booking can only be made for the weekend (Saturday & Sunday) Bookings required 48-hours in advance, via phone on 08442473271. Under 16 years must be accompanied by an adult and have signed parental consent form alongside their registration form. Must sign waiver. To confirm booking £9.99 per person non-attendance deposit required in advance. Deposit will be exchanged for 100 paint balls on arrival. The winner will be notified by phone or email and contact would need to be established before the prize can be issued. Details of previous winners can be obtained by writing to Westlers, Pelican Communications, 1 Holly House, Mill Street, Saddleworth, OL3 6LZ. Please enclose a stamped addressed envelope.